My name is Olga. I live with my family and my dogs in a quiet Boston suburb. 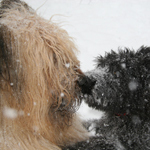 Briards are my passion and are an integral part of our family life. I first got introduced to the Breed in the summer of 1998 when I have decided that my life is finally organized enough to make space for a dog. I always loved large breeds, so the size was a given, but I had no idea what large breed would appeal to me and work for my family. There was also one fly in the ointment when it came to getting a dog – my husband did not want one. He owned a dog before for almost 19 years and when he had to put her down (she was very sick) it was so painful for him that he swore off all dogs forever. I, however, wanted my own dog to love in my lifetime and kept researching different breeds while trying to talk my husband into buying a puppy. Finally he grudgingly agreed to get a dog, on one condition: he had to really love the breed. From that point on he proceeded to reject every breed I suggested: one was not smart enough, another shed and smelled too much, one was too small, and another was too large. I probably could have eventually talked him into something, but the problem was – I was not in love with any particular breed either. 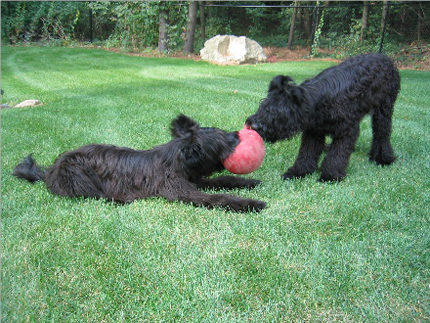 Until one day, we met a Briard and everything changed. After one chance meeting while walking down New York’s Madison Avenue, we both knew which breed had to be part of our lives. I had my answer and now I had to find my dog. I went looking for a breeder. 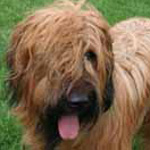 In my search I talked to various Briard owners a few Briard breeders. Everyone had a different approach on dealing with potential puppy buyers. There was one breeder though that impressed me immediately: she struck me as particularly honest, caring, direct, knowledgeable and no-nonsense. It was Liz Kenitz. I felt that I found the breeder whose choice of puppy for me I could trust. She must have felt a similar cense of trust with me, because 8 weeks later she sold me my perfect puppy on my word, without any written contract (something Liz never does with strangers). While I immediately knew that I had found my ideal Breeder, what I did not realize at that time was that I had also found an ideal mentor and friend, and an ideal business partner. That was then…..
Nine years passed…. With Henry’s and now also Boston's offspring growing up I suddenly found myself facing a new adventure. I did not simply produce a few litters; I became actively involved in the lives of all the puppies produced by Henry and his son Boston and even the lives of some of their families. Somehow along the way, without ever really intending it – I really became a breeder. 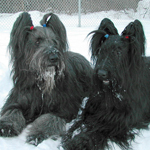 Last year Liz and I started talking about breeding Anka and a few other “kids” that I co-own and now I had to decide how I was going to proceed in the Briard world. What will my kennel name be? Before, when Liz asked me if I thought of a kennel name for myself, I always jokingly answered that I’m basically a Boston Chapter of Briardale. Now, that Liz and I again began making future plans, the kennel name decision came to me quite naturally. I asked Liz to officially expand her kennel into Massachusetts and to my delight she agreed. 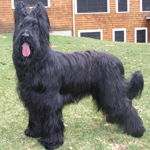 Briardale of Massachusetts was born and had its debut as a Kennel on this site. 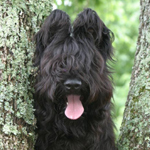 I can tell you that I owe much to Briards and to Liz. Both enriched my life in ways I could not dream of. Both relationships are truly special and I feel lucky to have these relationships in my life. Copyright 2013. Olga Shulman at Briard Breeder. All rights reserved.